Like Commencement Bay on a still and misty morning the “White Series” captures the subtle beauty of the Pacific Northwest. These ethereal low relief paintings give the sense of a secret, barely obscured, to be revealed at any moment. Richard Turner has been greatly influenced by his experience at Salmon Beach and its intimate connection with nature. This experience has molded him into a uniquely creative individual, part explorer, part developer and part witness to the irresistible natural forces that surround us. It’s a photographers’ job to capture a moment, but how exactly does one “capture” a moment? 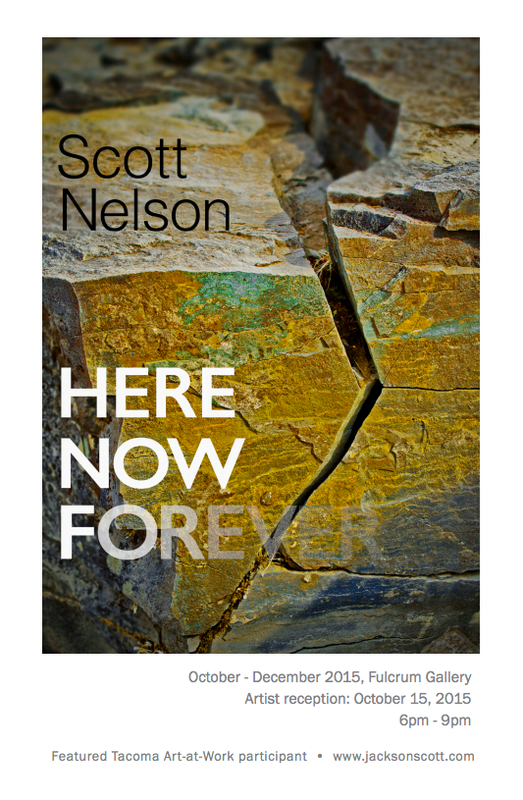 The act of plucking emotion from within the context of reality and distilling it into an artifact seems an impossible task, yet Scott accomplishes this and more in his new body of work titled “Here Now Forever”. These artworks are trophies distilled from explorations outside of the bonds of time. Some stretched like exotic animal skins; others composed to form their own visual language. Scott’s pieces offer us an omniscient view of existence, unfettered by the limiting perceptions of our physical being. 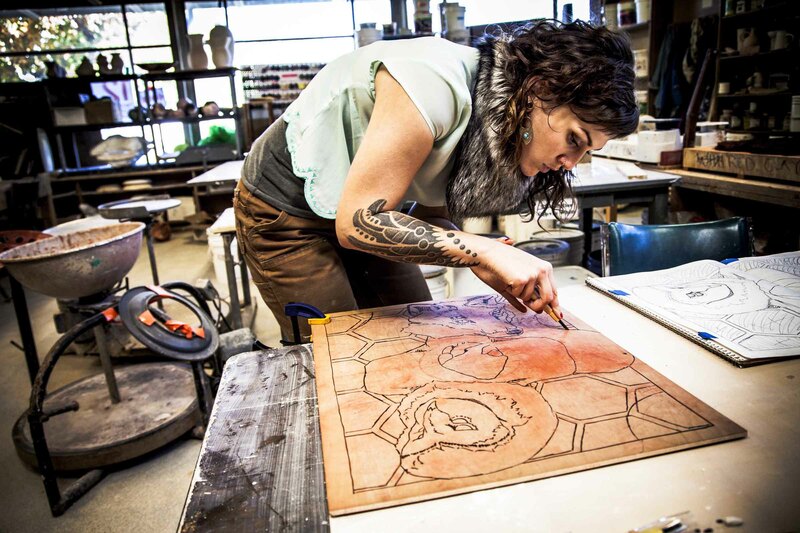 During open studios, Scott will demonstrate the process of transferring photo images to glass and other media. Anyone who stops by will be able to take part in the process, and will get to take home a small photo keepsake that they have helped to make. There is a relationship between animal and humankind that is overt and undeniable. We share innate qualities and characteristics that reveal both the civil and savage nature within beast and man. My work accentuates this relationship not only in its base form but also on an intimate and personal perspective. Each piece reflects an individuals’ introspective persona that is then displayed in the public eye. Every person creates a bond with a particular beast, whether consciously or not, that is perceived to represent our own persona. We glorify ourselves through the eyes of that animal within, using it to justify our deeds and desires, both condemning and exalting it when we feel the necessity. What I strive to do is bring forth an awareness of the light that we shed on the beast within ourselves, our daemon, and why. My work has deep roots in mythology and fairy tale, using fantastic circumstances to bring forth truths that can provide guidance as well as elaborate beauty. I look at the way Robert Bly dissects the story of “The Wild Man” in Iron John, a novel about the journey from childhood to adulthood and the circumstances and trials one must go through to become a man/woman. I like to use his method as a template through which I interpret individual stories and scenarios and then apply them to my work. In Bly’s novel, the boy must find a way to embrace the “wild man” before he can ever become his true self. Each piece I create reflects that journey and the wildness inside each of us. The balance and, at times, war between the civil and savage natures inside our persons and how we use that duality as a mask to the outside world is what my work is about. i Hate to be an encumbrance to Anyone or Anything in my world. i am absolutely respectful towards all creation. My Dear Good Owner Curator of Fulcrum,,, please, say this might work for you…. Worm Morphology’s tribute to Scorpio courtesy of the Enlightenment Cabinet – Overture to the Zodiac. on display at Fulcrum till the end of May.